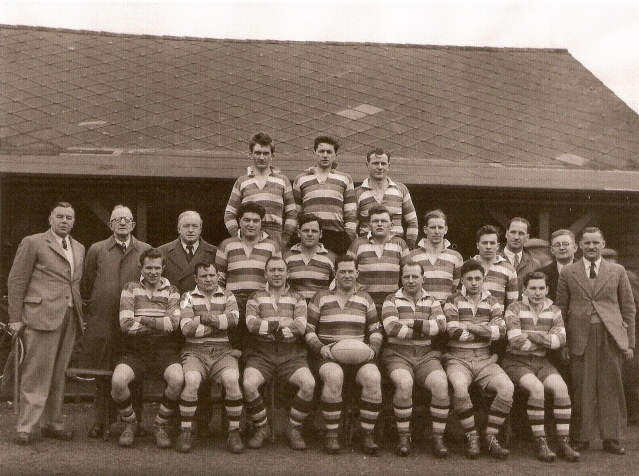 Back Row: George Brown, John Dingle, Alec Lewis. Middle Row: Harold Davies (Hon. Team Sec. ), Eddie Simpkins (Hon.Sec.) Arnold Ridley, Tom Smith, John Roberts, Unknown, Unknown, Ken Wilcox, Peter Boltwood, Jack Simpkins, A Ball. Front Row: Mick Hanna, Unknown, Jack Francis, Les Harter (Capt. ), Les. Moores, G Johns, Robin Hambly.